Develop an interest in learning other languages. Be empowered to communicate with others. Recognising the advantages that being able to communicate in another language offers. Develop a natural love of another language and engage in its structure, pronunciation and purpose. Develop a broad working vocabulary. Be introduced to another language in a way that is enjoyable and fun. Recognise that language has structure and the structure varies from one language to another. Learn about and respect how language is cornerstone to one’s culture and identity. Learn about and respect cultural differences. Through this they will promote and celebrate intercultural understanding. This will, in turn, promote cultural, geographical and anthropological understanding of another culture. Be able to understand and respond in verbal and written form. Increase their confidence whilst allowing them to recognise and celebrate diversity within society. Children will therefore foster the confidence to speak out aloud to each other with increasing fluency and increasingly accurate pronunciation. They will have begun to write words, phrases and sentences in another language with increasing confidence. Every other week, the children are asked 'What do you think of' a new celebrity. 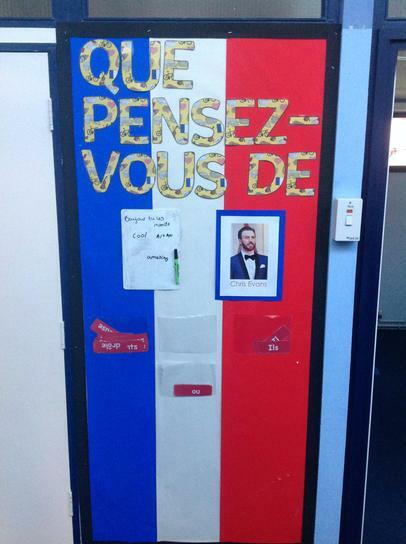 They must answer using French vocabulary and the children love this interactive display.